The mid-1960s was a time of profound change for the Inuit of Canada’s Eastern Arctic as they were moved off the land and into permanent settlements. A witness to that change was Terrence Ryan, then the resident arts advisor at the famous Cape Dorset print studio near the southern end of Baffin Island. In 1964, fearing the loss of traditional Inuit culture, Ryan embarked on an epic, four-month journey by dogsled to the island’s northern tip. Along the way, he distributed drawing paper and colour pencils, and asked people of all ages to record their history, culture, traditions or experiences for posterity. He received 1,842 drawings by 159 individuals, all produced within a span of several months. For many who contributed, it was the first and only time they put pencil to paper. Ryan maintained the collection for 50 years before arranging its transfer to the Canadian Museum of History in 2015. Gendreau says the collection reflects a multiplicity of voices and perspectives. 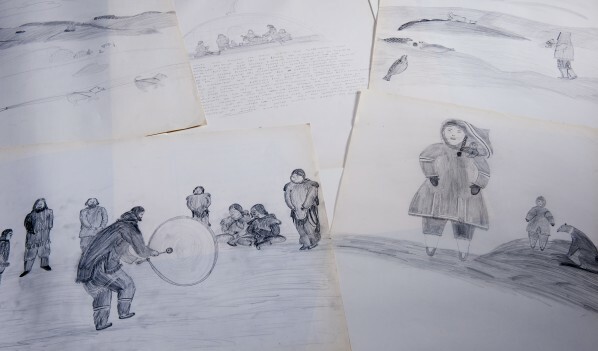 Some of the drawings are by members of the last generation of Inuit who were born on the land, lived in igloos and tents, and travelled by dogsled. Others are by members of the first generation to grow up in permanent communities. Some drawings portray scenes of daily life—new and old—while others depict legends, beliefs and spiritual practices. “There is such a richness in the historical detail,” says Gendreau, making the collection of great value to researchers and others interested in the study and preservation of traditional Inuit culture, including the artists’ descendants. Gendreau adds that the level of artistry is diverse, ranging from the simple drawings of children to more sophisticated renderings that reflect a wonderful eye for colour and composition, and a high degree of imagination and natural talent. But it’s the documentary value that makes the drawings so precious. “The collection is a library of the experience and knowledge of the people who were living in the north at that time,” says Gendreau, and will help the Museum preserve and present the story of Canada and its people for the benefit of present and future generations.